For other uses, see Carus (disambiguation). Carus (Latin: Marcus Aurelius Carus Augustus; c. 222 – July or August 283) was Roman Emperor from 282 to 283, and was 60 at ascension. During his short reign, Carus fought the Germanic tribes and Sarmatians along the Danube frontier with success. He brought stability in the empire and died in 283 aged 61. During his campaign against the Sassanid Empire, he sacked their capital Ctesiphon, but died shortly thereafter. He was succeeded by his sons Carinus and Numerian, creating a dynasty which, though short-lived, granted further stability to a resurgent empire. Carus, whose name before the accession may have been Marcus Numerius Carus, was likely born at Narbo (modern Narbonne) in Gaul but was educated in Rome. He was a senator and filled various civil and military posts before being appointed prefect of the Praetorian Guard by the emperor Probus in 282. After the murder of Probus at Sirmium, Carus was proclaimed emperor by the soldiers. Although Carus severely avenged the death of Probus, he was suspected as an accessory to the deed. He does not seem to have returned to Rome after his accession, contenting himself with an announcement to the Senate. 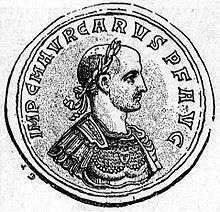 Bestowing the title of Caesar upon his sons Carinus and Numerian, he left Carinus in charge of the western portion of the empire and took Numerian with him on an expedition against the Persians, which had been contemplated by Probus. Having defeated the Quadi and Sarmatians on the Danube, for which he was given the title Germanicus Maximus, Carus proceeded through Thrace and Asia Minor, annexed Mesopotamia, pressed on to Seleucia and Ctesiphon, and marched his soldiers beyond the Tigris. The Sassanid King Bahram II, limited by internal opposition and his troops occupied with a campaign in modern-day Afghanistan, could not effectively defend his territory. The victories of Carus avenged all the previous defeats suffered by the Romans against the Sassanids, and he received the title of Persicus Maximus. Carus' hopes of further conquest were cut short by his death, which was announced after a violent storm. His death was variously attributed to disease, the effects of lightning, or a wound received in the campaign against the Persians. The fact that he was leading a victorious campaign, and his son Numerian succeeded him without opposition, suggest that his death may have been due to natural causes. This article incorporates text from a publication now in the public domain: Chisholm, Hugh, ed. (1911). "Carus, Marcus Aurelius". Encyclopædia Britannica (11th ed.). Cambridge University Press. ↑ In Classical Latin, Carus' name would be inscribed as MARCVS AVRELIVS CARVS AVGVSTVS. Wikimedia Commons has media related to Carus.